Just Google it. A new tool we never knew we needed has just rolled out from deep within the goat-maintained Googleplex. 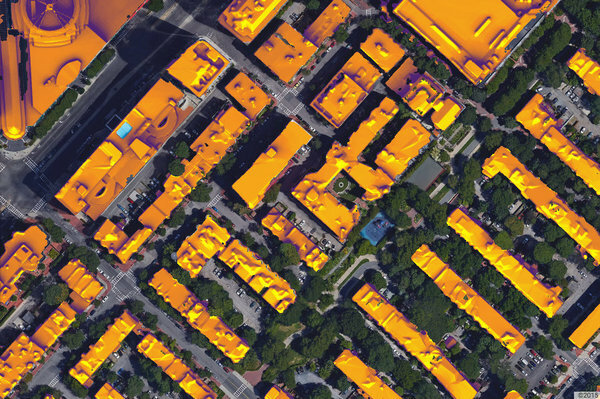 Project Sunroof, engineered by East Coast Googler Carl Elkin, proves to solar-skeptical homeowners that solar power is attainable, affordable and practical. And who wouldn’t trust the all-knowing Google? The concept: plug in your address and the big G estimates how much you could save by going solar, with the help of a few self-set indicators. The tool also generates the amount of roof space available to accommodate solar panels and the hours your roof soaks up sun each year, taking into account factors like sun positions, local climate, roof orientation and surrounding shade. It’s basically Google Earth, but more sunshine-y. Project Sunroof was born out of Google’s “20%” policy, which encourages employees like Elkin to spend 20 percent of their time on side projects, presumably to make Google more awesome. (If you’re counting, that’s one day out of a five-day work week.) Still in its test phase, the tool currently maps homes in the Boston metro area, the San Francisco Bay area and Fresno, Calif. The launch of the project comes on the heels of a White House effort to “scale up” solar for low- and moderate-income households. The Department of Energy approximates more than half a million homes nationwide are powered by solar. To give Project Sunroof a go, click here. I would be very interested in finding out the cost for installing a solar system on our house. We get a lot of south and west facing sun. It is a pyramid shaped home. Sure solar is practical! To the businesses that make & sell them! The average solar cell efficiency is about 20%-25% on a full sunny day. How many of these type of days are in the north, north east or the east coast? Maybe 45% of the year where solar panels could work. How would you use these in major cities where there’s a limited amount of roof space? When cloudy or raining, you have to switch back to the old grid to power your home. Do the math! There’s a 30 year payback just for the cost of the panels, installation, etc. vs. saving a few pennies per kwhr. This doesn’t include maintenance of the equipment. Nobody knows what that will cost because the technology is too new to have a track record. Look at the windmills at Altamont Pass in Livermore. The cost of each wind turbine is close to $500k and 90% of the time they are not spinning. Why? No wind and no money to repair the defective ones! This is not counting the amount of energy needed to make one of these windmills at the factory. There’s an old saying in the engineering world: “Just because you can do something doesn’t mean you should”. Why do people at Google live in a dreamworld? Because these are inexperienced young college grads who never had any real practical life experiences who have unlimited budget to waste chasing a dream.. Damn! It looks like it hasn’t reached my home yet. This is way out of whack! First of all, this model assumes a 2.2% increase in electrical costs each year for 20 years! Then, the lease costs is ridiculously low – it is about 1/3 of what normal lease costs are. Finally, on the lease payments, it is assuming that any incentives are going to you as the user of the system, when they actually go to the lease company. Looking forward to the expansion of this tool, both domestically and internationally. We are 95% solar at our home in Costa Rica and are always happy to see more panels being installed in Virginia especially for commercial usage. I am looking forward to using this service when I design and build another home. Can you project savings on a future home that has not been built yet. When will you be in RI ? I have Real Estate customer’ s that would be interested when they replace there roof !! Well-meaning green energy loan and lease programs that were crafted to put idled contractors to work and pump up home values need to be scrutinized carefully, as real estate agents and consumers are facing difficulties when it comes time to refinance or sell a home with a HERO or PACE loan. Many homeowners argue they were led to believe such loans went with the house to the buyer, if it was sold or refinanced. However, officials say the disclosures about potential resale or refinance consequences are not clear. Few lenders will finance or refinance homes with these programs. Dennis Smith,Your right! I am an appraiser and everyone with solar says how much it increases the value of their home. The reality is that in Louisiana it actually has no effect that we can find. It can actually have a negative effect as over 95% of systems are lease to own options where the solar company got all the money up front and then you have a 10 year maintenance contract. The new homebuyer has to want your less than new solar system or someone has to remove it and fix the roof. Then the buyer has to want the added cost to try and take over your lease. Most lenders don’t want an added lien on the title and in the American way, most people are buying a home that they just qualify for. This added risk for the lender or higher house note for the buyer can actually kill or delay a tight real estate finance deal.